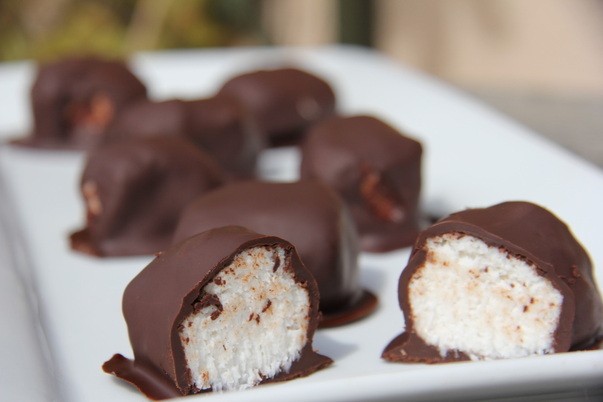 Bounty bars used to be one of my favourite treats, chocolate and coconut together..yum! I have also read a few reports saying that Bounty bars are not gluten free…so best to make them yourself! It’s always better to make things yourself too, as you know what exactly has gone into it! You could even play around with the filling flavours too…add a spice or two to the coconut filling! When I first made this, the coconut mixture was not as firm as I wanted. So I simply added more desiccated coconut to the mixture and it seemed to work. I have adjusted the recipe accordingly, but if your mixture initially is too wet, just add more coconut. Also, if you do not have Agave syrup you could use honey instead. Heat the coconut cream, coconut oil and Agave syrup in a pan and stir. Add the vanilla and mix. Take off the heat and then add the desiccated coconut. Pour into a greased tin and refrigerate overnight. Melt half of the chocolate in a Bain marie (bowl over simmering water). Take off from the heat and then whisk in the other chocolate until it is all melted. Cut the coconut filling into squares, and dip into the melted chocolate. Place them on greaseproof or waxed paper to set. This entry was posted on 06/02/2012 by glutenfreeuae in Baking, Recipes and tagged bounty, chocolate, coconut, gluten free, glutenfree.